Recently a special delivery came my way, a whole shipment of a variety of balsamic vinegar from Leonardo e Roberto’s Gourmet Blends. This coupled with all of the veganites in my life made me want to explore a whole world of vegan recipes for my vegan loving friends. 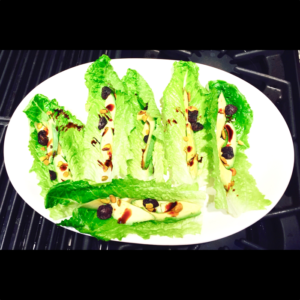 This recipe is super easy, and what better than a finger food just in time for Superbowl Sunday?! Once you wash and dry the romaine lettuce “cups” you can start loading them up! 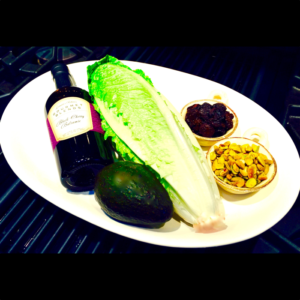 Thinly slice the avocado, place them onto the lettuce cups, sprinkle with some pistachio nutmeats, then add a few dried cherries. Drizzle over the top with Black Cherry Balsamic Vinegar from Gourmet Blends and this dish is ready to serve. Even my carnivorous Hubby said this recipe is a winner when he popped into my test tasting kitchen! Vegan, vegetarian, gluten free, appetizer, side dish, finger food, no cook recipe.